Phi Eta Sigma Graduation Cords are Gold and Black Double Cords. The double cord is made up of one black cord and one gold cord tied together. 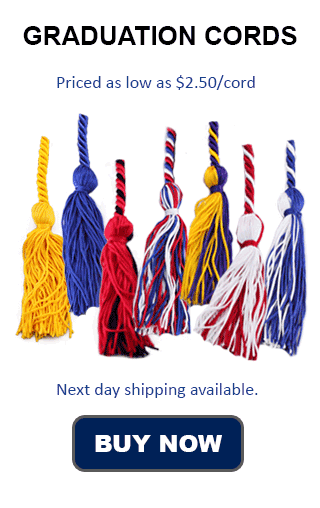 While the ropes of the honor cords themselves are solid in color, the tassels at either end are mixed black and gold. At Honors Graduation we do not carry cords exactly like this, but we can do Black and Gold double cords, which are very similar (the tassels are just solid along with the cords instead of mixed). Another society that uses these colors is the Beta Club. To be eligible to become a member of Phi Eta Sigma, a freshman honor society, you must have at least a 3.5 grade point average at the end of a semester of your freshman year. Once one becomes a member of Phi Eta Sigma they are a member for life, and no longer need to maintain the 3.5 GPA to retain membership (though it is probably encouraged). The society was founded in 1923 at the University of Illinois. Phi Eta Sigma is the first freshman honor society, and is also the largest one today. Its colors, like its graduation cords, are black and gold. The coat of arms of Phi Eta Sigma is black and gold with a star, an oil lamp, a pyramid, and a Greek phrase meaning knowledge is power. That Greek phrase is where they got the name Phi Eta Sigma. Phi Eta Sigma awards over a quarter of a million dollars in scholarships each year, and has nearly one million lifetime members. There are chapters of Phi Eta Sigma all around the United States, including chapters at the University of Puget Sound, Southern Methodist University, University of Tennessee, and Murray State University.